Among the subjects painted by Jacob van Ruisdael, along with scenes of dunes, fields and forests, are his marine views, although these are fewer in number. The date when the artist first began to depict marine themes has been the subject of widespread debate. Stechow considered that Van Ruisdael began to produce such works in the 1660s, coinciding with his move to Amsterdam. Rosenberg, however, considered that he might have already been painting them in the 1640s, while Slive suggested the late 1640s as a starting point. 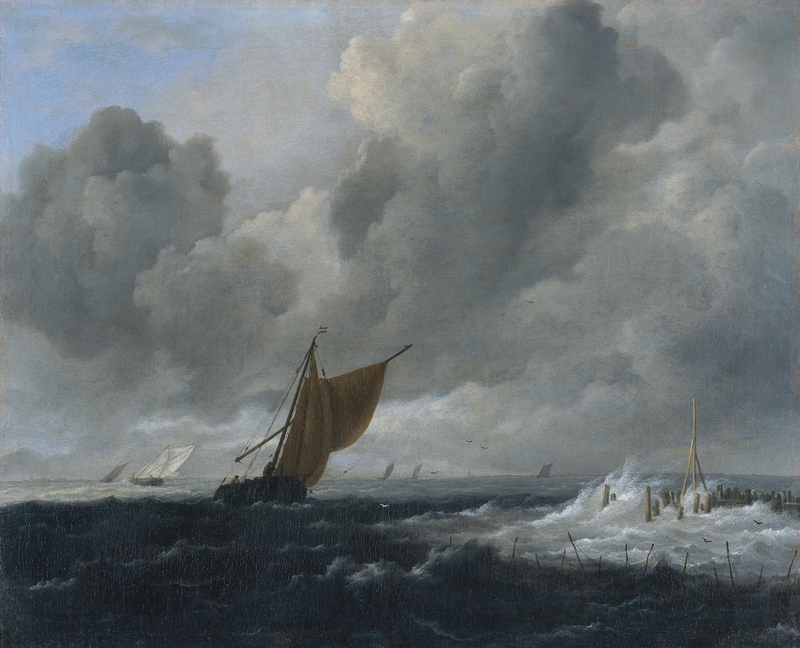 The influence of two earlier painters has been noted on Van Ruisdael’s marine views: Jan Porcellis, who modernised this genre, and his follower Simon de Vlieger. Van Ruisdael’s marine views were either specific commissions or were intended for sale on the open market. In the present canvas the artist used a format that is to be found in a number of his marine views with some changes to the elements involved. We see a bold, volumetric sky that becomes one of the most important elements in the painting, occupying three-quarters of the surface area while the sea is reduced to a narrow strip. The water is depicted as rough and choppy, whipped up into waves by the wind that also fills the slanting sails of the boats, pushing them forwards in the water. On occasions Van Ruisdael located a faint strip of land on the horizon with the forms of a city, while other compositions include areas of rock or buoys or other maritime signals made from wooden poles, as we see here on the right. His boats, sailing vessels and small craft are usually located in the middle and far distance, with the foreground occupied by a rough sea on which the sunlight is rarely to be seen in the immediate foreground. This is generally in shadow while the more distant planes have alternating strips of light that create strong contrasts. In this example the large, s-shaped area of darkness created by the shadow of the cloud covers the largest vessel, while the buoy on the right creates a contrast by means of the white foam breaking around it. 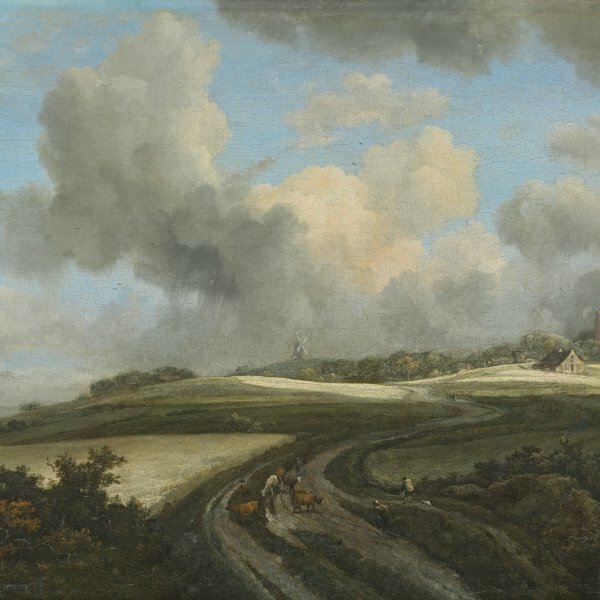 Gaskell mentioned the similarity between this canvas and one by Turner entitled Port Ruysdael in the Yale Centre for British Art in New Haven. He suggested that Turner might have seen the present canvas when it was in London as it was to be found there from 1817 and was auctioned on two occasions. The buoys, beacons and other maritime warning signals that appear in this group of paintings by Van Ruisdael have been read as referring to the journey of life and to Christ as the safe haven for mankind.